Please select the map of your choice and check your terminal. Airlines operating in each have been listed per terminal. These maps are basic please refer to official websites for more details about services and last update about it. 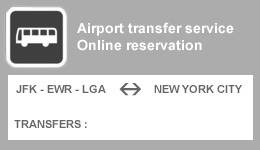 Ground transportation : Shuttle service is operated between Kennedy, Newark and LaGuardia and Manhattan hotels : This transfer must be booked at least 24 hours in advance of your travel date. Confirmation for this product will be received at time of booking. New York is served by three airports : Kennedy, Newark and LaGuardia : Please select the one you need and learn more about its exact location or your exact arrival or departure terminal. 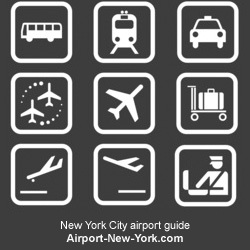 Airport-New-York.com is an independent non official guide to airports serving NYC : See airlines operation in each of them, book your transportation to Manhattan Hotels - Compare prices to find the right place to stay in NYC and get the best deals online. Also check the terminals maps to get more acquainted to the terminal of your arrival and ease your way to New York City Center. On this page: New York airport map.